Remaining assay results from KHDDH488 expected in the coming weeks. TORONTO, Feb. 28, 2019 (GLOBE NEWSWIRE) -- Xanadu Mines Ltd (ASX: XAM, TSX: XAM) (“Xanadu” or “the Company”) is pleased to report partial assay results for diamond drill hole KHDDH488 which has returned a thick intercept of high-grade copper and gold mineralisation. The latest drilling results have confirmed a transition to higher temperature sulphide mineral assemblages such as bornite in the intrusive root to the deposit, with a significant increase in the gold-to-copper ratio associated with increasing bornite. The high-grade bornite occurs within a highly mineralised quartz monzodiorite intrusion that appears to be one of the primary sources of mineralisation for the entire Kharmagtai deposit, which is located in the south Gobi region of Mongolia (Figures 1 and 2). The current drilling is targeting high-grade mineralisation associated with the causative copper and gold porphyry at depth. 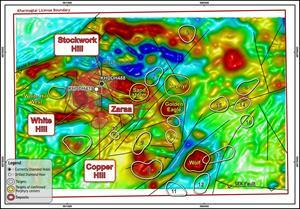 Xanadu’s Managing Director & Chief Executive Officer, Dr Andrew Stewart, said “After two and a half years of intensive exploration, it is remarkable that our drilling has intersected a significant new zone of bornite-rich porphyry which has produced one of the best intersections of copper and gold mineralisation encountered on the property. Like most classic gold-rich porphyry systems, the target is the bornite zone which correlates with high copper values, but significantly also a higher gold-to-copper ratio. Drilling is targeting mineralisation below chalcopyrite‐gold mineralisation to test for a higher-grade bornite core in the root zones of the causative porphyry intrusion. 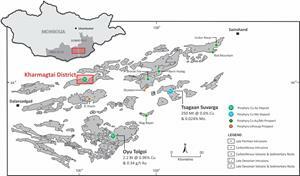 High-grade mineralisation may manifest as bornite‐gold‐cemented breccia or as bornite‐gold stockwork mineralisation in the causative intrusive. and 10m @ 2.24% Cu and 5.28g/t Au (5.60% eCu or 8.78g/t eAu) from 658m. Assays for the remaining 400 metres of the drill hole are expected in the coming weeks. A wedge hole KHDDH488a as been initiated to test up-dip of this intercept and define the orientation of the high-grade bornite mineralisation. Including 86m @ 0.78% Cu and 1.91g/t Au (2.0% eCu or 3.14g/t eAu) from 558m. The high-grade bornite zone as currently drilled, appears to be the tip of a wedge of mineralisation that could broaden significantly at depth. Drilling will focus on expanding this wedge of mineralisation in the coming months. The information in this announcement that relates to exploration results is based on information compiled by Dr Andrew Stewart who is responsible for the exploration data, comments on exploration target sizes, QA/QC and geological interpretation and information. Dr Stewart, who is an employee of Xanadu and is a Member of the Australasian Institute of Geoscientists, has sufficient experience relevant to the style of mineralisation and type of deposit under consideration and to the activity he is undertaking to qualify as the “Competent Person” as defined in the 2012 Edition of the “Australasian Code for Reporting Exploration Results, Mineral Resources and Ore Reserves” and the National Instrument 43-101. Dr Stewart consents to the inclusion in the report of the matters based on this information in the form and context in which it appears. The copper equivalent (CuEq) calculation represents the total metal value for each metal, multiplied by the conversion factor, summed and expressed in equivalent copper percentage. Grades have not been adjusted for metallurgical or refining recoveries and the copper equivalent grades are of an exploration nature only and intended for summarising grade. The copper equivalent calculation is intended as an indicative value only. The following copper equivalent conversion factors and long-term price assumptions have been adopted: Copper Equivalent Formula (CuEq) = Cu% + (Au (ppm) x 0.6378). Based on a copper price of $2.60/lb and a gold price of $1,300/oz. Intercepts are weighted averages to ensure different sample lengths do not skew the results. There is insufficient information to understand true widths at this stage. Due to the size of the system and current ambiguity around orientation of the drill hole relative to minor diluting intrusives, a larger than normal internal dilution of 9m has been used to calculate a geologically relevant intercept. Cut-off grades and maximum dilution details are included in the tabulated intercepts for clarity. Set out below is Section 1 and Section 2 of Table 1 under the JORC Code, 2012 Edition for the Kharmagtai project. Data provided by Xanadu. This Table 1 updates the JORC Table 1 disclosure dated 31 July 2018. Nature and quality of sampling (e.g. cut channels, random chips, or specific specialized industry standard measurement tools appropriate to the minerals under investigation, such as down hole gamma sondes, or handheld XRF instruments, etc.). These examples should not be taken as limiting the broad meaning of sampling. In cases where ‘industry standard’ work has been done this would be relatively simple (e.g. ‘reverse circulation drilling was used to obtain 1 m samples from which 3 kg was pulverised to produce a 30 g charge for fire assay’). In other cases more explanation may be required, such as where there is coarse gold that has inherent sampling problems. Unusual commodities or mineralisation types (e.g. submarine nodules) may warrant disclosure of detailed information. The resource estimate is based on diamond drill core samples, RC chip samples and channel samples from surface trenches. Representative ½ core samples were split from PQ, HQ & NQ diameter diamond drill core on site using rock saws, on a routine 2m sample interval that also honours lithological/intrusive contacts. The orientation of the cut line is controlled using the core orientation line ensuring uniformity of core splitting wherever the core has been successfully oriented. Sample intervals are defined and subsequently checked by geologists, and sample tags are attached (stapled) to the plastic core trays for every sample interval. RC samples are uniform 2m samples formed from the combination of two ¼ split 1m samples. Drill type (e.g. core, reverse circulation, open-hole hammer, rotary air blast, auger, Bangka, sonic, etc.) and details (e.g. core diameter, triple or standard tube, depth of diamond tails, face-sampling bit or other type, whether core is oriented and if so, by what method, etc.). The Mineral Resource estimation has been based upon diamond drilling of PQ, HQ and NQ diameters with both standard and triple tube core recovery configurations, RC drilling and surface trenching with channel sampling. All drill core drilled by Xanadu has been oriented using the “Reflex Ace” tool. Diamond drill core recoveries were assessed using the standard industry (best) practice which involves: removing the core from core trays; reassembling multiple core runs in a v-rail; measuring core lengths with a tape measure, assessing recovery against core block depth measurements and recording any measured core loss for each core run. Diamond core recoveries average 97% through mineralization. Overall, core quality is good, with minimal core loss. Where there is localized faulting and or fracturing core recoveries decrease, however, this is a very small percentage of the mineralized intersections. Analysis of recovery results vs grade shows no significant trends that might indicate sampling bias introduced by variable recovery in fault/fracture zones. All drill core is geologically logged by well-trained geologists using a modified “Anaconda-style” logging system methodology. The Anaconda method of logging and mapping is specifically designed for porphyry Cu-Au mineral systems and is entirely appropriate to support Mineral Resource Estimation, mining and metallurgical studies. Logging of lithology, alteration and mineralogy is intrinsically qualitative in nature. However, the logging is subsequently supported by 4 Acid ICP-MS (48 element) geochemistry and SWIR spectral mineralogy (facilitating semi-quantitative/calculated mineralogical, lithological and alteration classification) which is integrated with the logging to improve cross section interpretation and 3D geological model development. Drill core is also systematically logged for both geotechnical features and geological structures. Where drill core has been successfully oriented, the orientation of structures and geotechnical features are also routinely measured. Both wet and dry core photos are taken after core has been logged and marked-up but before drill core has been cut. All drill core samples are ½ core splits from either PQ, HQ or NQ diameter cores. A routine 2m sample interval is used, but this is varied locally to honour lithological/intrusive contacts. The minimum allowed sample length is 30cm. Core is appropriately split (onsite) using diamond core saws with the cut line routinely located relative to the core orientation line (where present) to provide consistency of sample split selection. The diamond saws are regularly flushed with water to minimize potential contamination. A field duplicate ¼ core sample is collected every 30th sample to ensure the “representivity of the in situ material collected”. The performance of these field duplicates are routinely analysed as part of Xanadu’s sample QC process. Routine sample preparation and analyses of DDH samples were carried out by ALS Mongolia LLC (ALS Mongolia), who operates an independent sample preparation and analytical laboratory in Ulaanbaatar. All samples were prepared to meet standard quality control procedures as follows: Crushed to 75% passing 2mm, split to 1kg, pulverised to 85% passing 200 mesh (75 microns) and split to 150g sample pulp. ALS Mongolia Geochemistry labs quality management system is certified to ISO 9001:2008. The sample support (sub-sample mass and comminution) is appropriate for the grainsize and Cu-Au distribution of the porphyry Cu-Au mineralization and associated host rocks. Au is determined using a 25g fire assay fusion, cupelled to obtain a bead, and digested with Aqua Regia, followed by an atomic absorption spectroscopy (AAS) finish, with a lower detection (LDL) of 0.01 ppm. All samples were also submitted to ALS Mongolia for the 48 element package ME-ICP61 using a four acid digest (considered to be an effective total digest for the elements relevant to the MRE). Where copper is over-range (>1% Cu), it is analysed by a second analytical technique (Cu-OG62), which has a higher upper detection limit (UDL) of 5% copper. Quality assurance has been managed by insertion of appropriate Standards (1:30 samples – suitable Ore Research Pty Ltd certified standards), Blanks (1:30 samples), Duplicates (1:30 samples – ¼ core duplicate) by XAM. Assay results outside the optimal range for methods were re-analysed by appropriate methods. Ore Research Pty Ltd certified copper and gold standards have been implemented as a part of QC procedures, as well as coarse and pulp blanks, and certified matrix matched copper-gold standards. QC monitoring is an active and ongoing processes on batch by batch basis by which unacceptable results are re-assayed as soon as practicable. Prior to 2014: Cu, Ag, Pb, Zn, As and Mo were routinely determined using a three-acid-digestion of a 0.3g sub-sample followed by an AAS finish (AAS21R) at SGS Mongolia. Samples were digested with nitric, hydrochloric and perchloric acids to dryness before leaching with hydrochloric acid to dissolve soluble salts and made to 15ml volume with distilled water. The LDL for copper using this technique was 2ppm. Where copper was over-range (>1% Cu), it was analysed by a second analytical technique (AAS22S), which has a higher upper detection limit (UDL) of 5% copper. Gold analysis method was essentially unchanged. All assay data QAQC is checked prior to loading into XAM’s Geobank data base. The data is managed by XAM geologists. The data base and geological interpretation is managed by XAM. Check assays are submitted to an umpire lab (SGS Mongolia) for duplicate analysis. No twinned drill holes exist. There have been no adjustments to any of the assay data. Diamond drill holes have been surveyed with a differential global positioning system (DGPS) to within 10cm accuracy. Historically, Eastman Kodak and Flexit electronic multi-shot downhole survey tools have been used at Kharmagtai to collect down hole azimuth and inclination information for the majority of the diamond drill holes. Single shots were typically taken every 30m to 50m during the drilling process, and a multi-shot survey with readings every 3-5m are conducted at the completion of the drill hole. As these tools rely on the earth’s magnetic field to measure azimuth, there is some localised interference/inaccuracy introduced by the presence of magnetite in some parts of the Kharmagtai mineral system. The extent of this interference cannot be quantified on a reading-by-reading basis. The project DTM is based on 1 m contours from satellite imagery with an accuracy of ±0.1 m.
Holes spacings range from <50m spacings within the core of mineralization to +500m spacings for exploration drilling. Hole spacings can be determined using the sections and drill plans provided. Holes range from vertical to an inclination of -60 degrees depending on the attitude of the target and the drilling method. The data spacing and distribution is sufficient to establish anomalism and targeting for porphyry Cu-Au, tourmaline breccia and epithermal target types. Holes have been drilled to a maximum of 1,300m vertical depth. The data spacing and distribution is sufficient to establish geological and grade continuity, and to support the Mineral Resource classification. Drilling is conducted in a predominantly regular grid to allow unbiased interpretation and targeting. Scissor drilling, as well as some vertical and oblique drilling, has been used in key mineralised zones to achieve unbiased sampling of interpreted structures and mineralised zones, and in particular to assist in constraining the geometry of the mineralised hydrothermal tourmaline-sulphide breccia domains. Samples are delivered from the drill rig to the core shed twice daily and are never left unattended at the rig. Samples are dispatched from site in locked boxes transported on XAM company vehicles to ALS lab in Ulaanbaatar. Sample shipment receipt is signed off at the Laboratory with additional email confirmation of receipt. Samples are then stored at the lab and returned to a locked storage site. Internal audits of sampling techniques and data management are undertaken on a regular basis, to ensure industry best practice is employed at all times. 2012: AMC Consultants Pty Ltd. was engaged to conduct an Independent Technical Report which reviewed drilling and sampling procedures. It was concluded that sampling and data record was to an appropriate standard. 2013: Mining Associates Ltd. was engaged to conduct an Independent Technical Report to review drilling, sampling techniques and QAQC. Methods were found to conform to international best practice. 2018: CSA Global reviewed the entire drilling, logging, sampling, sample shipping and laboratory processes during the competent persons site visit for the 2018 MRe, and found the systems and adherence to protocols to be to an appropriate standard. The Project comprises 1 Mining Licence (MV-17387A). The Kharmagtai mining license MV-17387A is 100% owned by Oyut Ulaan LLC. Xanadu has an 85% interest in Mongol Metals LLC, which has 90% interest in Oyut Ulaan LLC. The remaining 10% in Oyut Ulaan LLC is owned by Quincunx (BVI) Ltd (“Quincunx”). The Mongolian Minerals Law (2006) and Mongolian Land Law (2002) govern exploration, mining and land use rights for the project. Detailed exploration was conducted by Quincunx Ltd, Ivanhoe Mines Ltd and Turquoise Hill Resources Ltd including extensive surface mapping, trenching, diamond drilling, surface geochemistry and geophysics. The mineralisation is characterised as porphyry copper-gold type. Porphyry copper-gold deposits are formed from magmatic hydrothermal fluids typically associated with felsic intrusive stocks that have deposited metals as sulphides both within the intrusive and the intruded host rocks. Quartz stockwork veining is typically associated with sulphides occurring both within the quartz veinlets and disseminated thought out the wall rock. Porphyry deposits are typically large tonnage deposits ranging from low to high grade and are generally mined by large scale open pit or underground bulk mining methods. The prospects at Kharmagtai are atypical in that they are associated with intermediate intrusions of diorite to quartz diorite composition; however the deposits are significant in terms of gold:copper ratio, and similar to other gold-rich porphyry deposits. Diamond holes, RC holes and trenches are the principal source of geological and grade data for the Project. See figures in main report. Formula is based on a $3.1/lb copper price and a $1,320/oz gold price. A relative gold to copper recovery factor of 82.35% was used (85% copper recovery and 70% gold recovery), gold to copper conversion factor of 0.62097 was applied. All prices are in USD. Mineralised structures are variable in orientation, and therefore drill orientations have been adjusted from place to place in order to allow intersection angles as close as possible to true widths. Exploration results have been reported as an interval with 'from' and 'to' stated in tables of significant economic intercepts. Tables clearly indicate that true widths will generally be narrower than those reported. Resources have been reported at a range of cut-off grades, above a minimum suitable for open pit mining, and above a minimum suitable for underground mining. Extensive work in this area has been done and is reported separately. See the company website for significant announcements and milestones. Work that has been done includes; relogging of core, structural studies, alteration studies, geotechnical studies and preliminary metallurgical test works. The project has been subject to various geophysical studies including aeromagnetic, radiometric surveys and electromagnetic surveys over discrete targets. 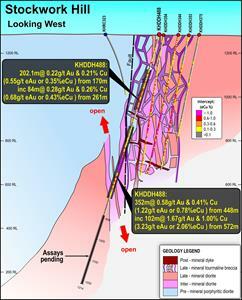 The mineralisation is open at depth and along strike. Current estimates are restricted to those expected to be reasonable for open pit mining. 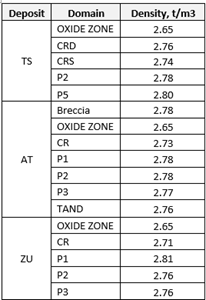 Limited drilling below this depth (- 300m rl) shows widths and grades potentially suitable for underground extraction. The database is managed using Micromine Geobank software. Data is logged directly into an Excel spread sheet logging system with drop down field lists. Validation checks are written into the importing program ensures all data is of high quality. Digital assay data is obtained from the Laboratory, QA/QC checked and imported. Geobank exported to CSV TEXT and imported directly to the Micromine software used for the MRE. The combined database was provided for the MRE. Total length of trenches is less than the total length of all samples. No logical errors were identified in the analytical data. Warren Potma, an employee of CSA Global, visited the Kharmagtai project, located in Mongolia, over 4 days from 18th to 22nd September 2018. The site visit was required for the purposes of inspection, ground truthing, review of activities, and collection of information and data. Geological data has been collected in a consistent manner that has allowed the development of geological models to support the Mineral Resource estimate. Copper and gold mineralisation is controlled by porphyry phases, oxidation zone, level of veining, breccia, country rocks and barren dykes. Full geological models of all major geological formations were developed for each deposit, and the block models were domained accordingly. Domaining of the deposit mineralisation was based on the current understanding of the deposits’ geology. All major geological formations were wireframed by Xanadu geologists using Leapfrog software, including porphyry phases, country rocks, barren dyke, base of oxidation surface and breccia bodies. All geological formations were domained by the level of development of stockwork - <0.5% veining, 0.5-1.5% veining and >1.5% veining. All provided wireframe models were imported into Micromine software and validated by CSA Global. Geological interpretation and wireframing were based on sampling results of drill holes and trenches, which were logged at 2 m intervals (average). No alternative interpretations were adopted. Lithological logging was mainly used to interpret and to wireframe the geological formations. Geological logging of veining was used to wireframe the stockwork and breccia domains. Altan Tolgoi: The strike length of the mineralised zone is about 1,200 m. Width is up to 800 m, no plunging, traced down dip to 1,030 m. Mineralisation is outcropped at the surface. Tsagaan Sudal: The strike length of the mineralised zone is about 1,200 m. Width is up to 730 m, no plunging, traced down dip to 1,080 m. Mineralisation is outcropped at the surface. Zesen Uul: The strike length of the mineralised zone is about 630 m. Width is up to 150 m with apparent plunging to SW at about 40 degrees. traced down dip to 420 m dipping 70 degrees to SE. Mineralisation is outcropped at the surface. The MRE is based on surface drilling and trenching results using Ordinary Kriging (OK) to inform 20 m x 20 m x 20 m blocks. The block model was constrained by wireframes modelled for the geological formations of the deposits and coded and domained by the level of oxidation and level of veining. The OK interpolation was carried out separately for each geological domain of each deposit. Hard boundaries were used between the interpreted geological domains. The drill hole and trench data were composited to a target length of 2 m based on the length analysis of raw intercepts. Top-cuts were estimated separately for gold and coper grades for each modelled domain and applied to sampled intervals before length compositing. Previous JORC-compliant Mineral Resources were estimated by Mining Associates, and the estimate was available for review. No current mining is occurring at the Kharmagtai project. No by-products are assumed at this stage. Estimated molybdenum and silver grades appear to be sub-economic to extract at this stage of the project evaluation. Sulphur grades were interpolated into the models to establish their potential affect to metallurgical processing. The optimal parent cell size was selected in the course of block modelling. The linear parent cell dimensions along X- and Y-axes were 20 m x 20 m. The vertical parent cell dimension was 20 m. Block grades were interpolated using parent cell estimation. Nominal drill spacing was about 40 m x 40 m at the central parts of the deposits. It was assumed that a 20 m x 20 m x 20 m parent cell approximately reflects SMU for large scale open pit mining. No assumptions about correlation between variables were made. Geological interpretation was based on the results of detailed geological logging, which resulted in the development of wireframe models for all major geological formations for each deposit, which control copper and gold mineralisation (country rocks, porphyry phases, barren dyke. Logging of the level of veining and level of oxidation was used to develop wireframe models for the stockwork development (<0.5% veining, 0.5-1.5% veining and >1.5% veining) and also for breccia pipe and surface for the base of oxidation surface. The wireframe models for stockwork, breccia and oxidation were used to sub-domain the main geological formations of each deposit. All wireframe models were developed by Xanadu geologists using Leapfrog software. Top-cutting was applied separately for each geological domain and sub-domain based on the results of the classical statistical analysis. Moisture was not considered in the density assignment and all tonnage estimates are based on dry tonnes. A cut-off grade of 0.3% CuEq was used to report the Mineral Resources for open pit mining within the limits of ultimate undiscounted pit shell, and a cut-off of 0.5% CuEq was used to report the Mineral Resources for underground mining below the ultimate undiscounted pit shell. No mining factors have been applied to the in-situ grade estimates for mining dilution or loss as a result of the grade control or mining process. The deposit is amenable to large scale bulk mining. The Mineral Resource is reported above and outside of an optimised ultimate pit shell (Lerch Grossman algorithm), mineralisation below the pit shell is reported at a higher cut-off to reflect the increased costs associated with block cave underground mining. No metallurgical factors have been applied to the in-situ grade estimates. Metallurgical recoveries were used when copper equivalent grades were calculated in the model. The applied recoveries were 85% for copper and 70% for gold. Relative gold to copper recovery was 82%. An environmental baseline study was completed in 2003 by Eco Trade Co. Ltd. of Mongolia in cooperation with Sustainability Pty Ltd of Australia. The baseline study report was produced to meet the requirements for screening under the Mongolian Environmental Impact Assessment (EIA) Procedures administered by the Mongolian Ministry for Nature and Environment (MNE). The bulk density for bulk material must have been measured by methods that adequately account for void spaces (vugs, porosity, etc. 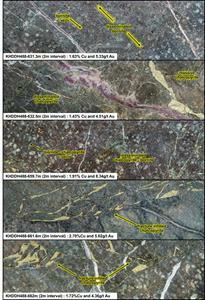 ), moisture and differences between rock and alteration zones within the deposit. A total of 4428 measurements for bulk density are recorded in the database, all of which were determined by the water immersion method. Average bulk density values were applied for each geological domain, though there could be variations in density values due to presence of sulphides or level of alteration. The Mineral Resource has been classified based on the guidelines specified in the JORC Code. The classification level is based upon an assessment of geological understanding of the deposit, geological and mineralization continuity, drill hole spacing, QC results, search and interpolation parameters and an analysis of available density information. Indicated Resources: It was decided that Indicated Mineral Resources be assigned to blocks which were explored with the drill density not exceeding approximately 65 m x 65 m with at least two mineralization intersections on exploration lines. Geological structures are relatively well understood and interpreted. Inferred Resources: Inferred Mineral Resources are model blocks lying outside the Indicated wireframes, which still display reasonable strike continuity and down dip extension, based on the current drill hole and trench intersections. Data quality, grade continuity, structural continuity and drill spacing were assessed by CSA Global to form an opinion regarding resource confidence. The classification reflects the Competent Person’s view of the deposit. The Mineral Resource block model was peer reviewed internally by a Principal Resource Geologist employed by CSA Global and the conclusion was made that the procedures used to estimate and classify the Mineral Resource are appropriate. The relative accuracy of the estimate is reflected in the classification of the deposit. The estimate is related to the global estimate of the deposit suitable for subsequent PFS or further exploration at the deposit. No historical production data is available for comparison with the MRE. The Mineral Resource accuracy is communicated through the classification assigned to various parts of the deposit. Ore Reserves are not reported so this is not applicable to this report.